A job killer bill that mandates a new protected leave of absence passed the Assembly Labor and Employment Committee yesterday. SB 63 (Jackson; D-Santa Barbara) prohibits an employer from refusing to allow an employee with more than 12 months of service with the employer, who has at least 1,250 hours of service with the employer during the previous 12-month period, and who works at a worksite in which the employer employs at least 20 employees within 75 miles, to take up to 12 weeks of parental leave to bond with a new child within one year of the child’s birth, adoption, or foster care placement. The bill also prohibits an employer from refusing to maintain and pay for coverage under a group health plan for an employee who takes this leave. 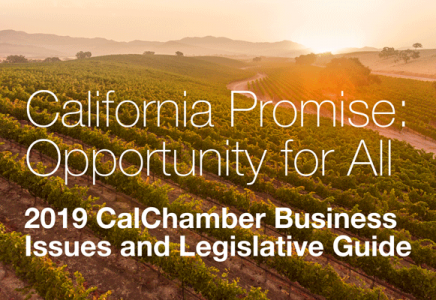 CalChamber has identified SB 63 as a job killer because the legislation targets and could significantly harm small employers in California with as few as 20 employees by adding to the existing burden under which they already struggle. Governor Edmund G. Brown Jr. vetoed a similar, but narrower, proposal just last year. SB 63 Creates a Combined 7-Month Protected Leave of Absence on Small Employers. California already requires employers with 5 or more employees to provide up to 4 months of protected leave for an employee who suffers a medical disability because of pregnancy. SB 63 will add another 12 weeks of leave for the same employee, totaling 7 months of potential protected leave. Such an extensive period of time is unreasonable to accommodate for a small employer with a limited workforce. SB 63 Could Affect Worksites that Have Substantially Fewer than 20 Employees. SB 63 is applicable to any employer that has 20 or more employees within a 75-mile radius. Employees at multiple worksites are aggregated together to reach the employee threshold under this proposal. Accordingly, a worksite that only has 5 employees will be required to accommodate this mandatory leave if there are other worksites in a 75-mile radius that have enough employees to reach the 20 employee threshold. The worksite of the employee who takes the leave is the location that will feel the impact of the protected leave. Exposing employers with a limited number of employees at a worksite to this extensive mandatory leave will create a hardship. SB 63 Imposes a Mandatory Leave, with No Discretion to the Employer. As a “protected leave,” with a threat of litigation to enforce it, SB 63 mandates the small employer to provide 12 weeks of leave. The leave under SB 63 must be given at the employee’s request, regardless of whether the employer has other employees out on other California required leaves. This mandate on such a small employer with a limited workforce creates a significant challenge for the employer’s ability to maintain operations. SB 63 Imposes Additional Costs on Small Employers that Are Struggling with the Increased Minimum Wage. Even though the leave under SB 63 is not “paid” by the employer, that does not mean the small employer will not suffer added costs. While the employee is on leave, the employer will have to: (1) maintain medical benefits while the employee is on leave; (2) pay for a temporary employee to cover for the employee on leave, usually at a higher premium; or (3) pay overtime to other employees to cover the work of the employee on leave. The cost of overtime is higher given the increase of the minimum wage, which will add to the overall cost on small employers. SB 63 Exposes Small Employers to Costly Litigation. SB 63 labels an employer’s failure to provide the 12-week leave of absence as an “unlawful employment practice.” This label is significant as it exposes an employer to costly litigation under the Fair Employment and Housing Act (FEHA).An employee who believes the employer did not provide the 12 weeks of protected leave, failed to return the employee to the same or comparable position, failed to maintain benefits while the employee was out on the 12 weeks of leave, or took any adverse employment action against the employee for taking the leave, could pursue a claim against the employer seeking: compensatory damages, injunctive relief, declaratory relief, punitive damages, and attorney’s fees. A 2015 study by insurance provider Hiscox regarding the cost of employee lawsuits under FEHA estimated that the cost for a small- to mid-size employer to defend and settle a single plaintiff discrimination claim was approximately $125,000. Last year, SB 654 (Jackson; D-Santa Barbara), a similar yet narrower proposal, was vetoed by Governor Brown. SB 654 mandated small employers to provide 6 weeks of leave, instead of 12 weeks, as proposed in SB 63. Despite Governor Brown’s request to consider options/amendments to limit litigation, SB 63 continues to expose small employers to costly litigation that will simply overwhelm them. California is already recognized by the National Conference of State Legislatures as one of the most family-friendly states given its list of programs and protected leaves of absence, including: paid sick days, school activities leave, kin care, paid family leave program, pregnancy disability leave, and the California Family Rights Act. This list is in addition to the leaves of absence required at the federal level. In a recent study titled “The Status of Women in the States: 2015 Work & Family,” California was ranked No. 2 for work and family policies that support workers keeping their jobs and also caring for their family members. Imposing an additional 12-week, mandatory leave of absence targeted specially at small employers is unduly burdensome. SB 63 passed the Assembly Labor and Employment Committee 5-1 on June 21. The bill now moves to the Assembly Judiciary Committee; no hearing date is currently set.